HINT: Removal procedure of the RH side is the same as that of the LH side. (a) Support the differential carrier assy rear with a jack. (b) Remove the 2 bolts and 2 lock nuts, and separate the rear differential support No.1 from the rear suspension member sub-assy. (c) Remove the 3 bolts and differential carrier sub-assy rear from the rear suspension member sub-assy. NOTICE: Be careful not to drop the differential carrier assy rear. HINT: Perform this operation only when the rear differential mount cushion No.1 is damaged. (a) Using SST, remove the rear differential mount cushion No.1. Do not bring SST into contact with the sub-frame. Do not slant the bolts of SST. Do not set the SST in the wrong direction. Screw the 2 bolts of SST equally into the 2 holes of the rear differential mount. HINT: Perform this operation only when the rear differential mount cushion No.2 is damaged. (a) Using SST, remove the rear differential mount cushion No.2. Do not slant the bolt of SST. (a) Remove the 2 bolts, 2 lock nuts and rear differential support No.1 from the differential carrier sub-assy rear. (a) Remove the 8 bolts from the carrier cover. (b) Using a brass bar and a hammer, separate the carrier cover from differential carrier sub-assy. (c) Remove the breather plug from the differential carrier cover. (a) Using a dial indicator, check the runout of the ring gear. (c) Inspect the contact pattern. 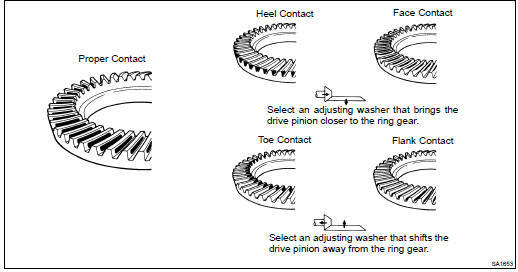 If tooth contact pattern is not correct, replace the adjusting washer installed on the front of the drive pinion rear bearing to adjust it. (a) Using a dial indicator, check the backlash of the side gear while holding 1 pinion gear toward the differential case. Backlash: 0.05 to 0.20 mm (0.0020 to 0.0079 in.) If the backlash is not within the specification, install the 2 side gear thrust washers of different thickness (See step 52). HINT: Measure the backlash of the side gear with the side gear shaft installed. (a) Using a dial indicator, measure the runout of the companion flange vertically and horizontally. If the runout is greater than the maximum, replace the rear drive pinion companion flange sub-assy rear. (a) Using a torque wrench, measure the preload of the drive pinion. If the preload is not within the specification, adjust the rear differential drive pinion preload or repair as necessary. HINT: This preload is within the backlash between the drive pinion and ring gear. (a) Using a torque wrench, measure the total preload. Total preload (at starting): Drive pinion preload plus 0.3 to 0.5 N*m (3 to 5 kgf*cm, 2.6 to 4.3 in. *lbf) If the total preload is not within the specification, adjust the total preload or repair as necessary. HINT: Disassemble and inspect the differential as necessary. (a) Using SST, remove the 2 oil seals from the housing. (a) Using SST and a hammer, unstake the staked part of the nut. (b) Using SST to hold the flange, remove the nut. (a) Using SST, remove the companion flange. (a) Using SST and a press, remove the dust deflector. (a) Using SST, remove the oil seal from the differential carrier. (a) Using SST, remove the front bearing from the drive pinion. (a) Align matchmarks on the bearing cap and differential carrier. (b) Remove the 4 bolts and 2 bearing caps. (c) Using SST and a hammer, remove the 2 plate washers. HINT: Measure the thickness of the plate washers and note it down. (d) Remove the differential case assy and the 2 bearing outer races from the differential carrier. HINT: Tag the 2 bearing outer races to show the location for reassembly. (a) Using SST and a press, remove the rear bearing from the drive pinion. HINT: If either the drive pinion or ring gear is damaged, replace both as a set. (b) Remove the plate washer. (a) Using a brass bar and a hammer, remove the front bearing (outer race) from the carrier. (a) Using a brass bar and a hammer, remove the rear bearing (outer race) from the carrier. (a) Align matchmarks on the ring gear and differential case. (b) Using a screwdriver and a hammer, unstake the 4 lock plates. (c) Remove the 8 ring gear set bolts and 4 lock plates. (d) Using a plastic hammer, tap on the ring gear to separate it from the differential case. (a) Install the differential case to the differential carrier. (b) Install the right and left bearing caps with the 4 bolts. Torque: 79 NVm (800 kgfVcm, 58 ftVlbf) (c) Using a dial indicator, measure the differential case runout. If the runout is greater than the maximum, replace the differential case assy with a new one. (d) Remove the differential case. 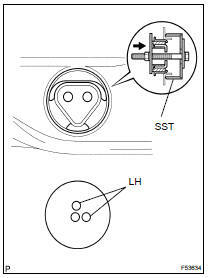 (a) Using SST, remove the case bearing (LH) from the differential case. 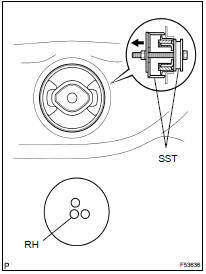 (a) Using SST, remove the case bearing (RH) from the differential case. (a) Using a pin punch (5 mm) and a hammer, remove the straight pin. (a) Check that there is no damage to the differential pinion gear and side gear. If the differential pinion gear and/or side gear is damaged, replace them with new ones. (a) Check that there is no damage to the differential case. If the differential case is damaged, replace it. (a) Install the 2 thrust washers to the 2 side gears. (b) Install the 2 side gears, 2 differential pinion gears, 2 differential pinion thrust washers and differential pinion shaft to the differential case. HINT: Align the holes of the differential case and differential pinion shaft. (a) Measure the side gear backlash while holding 1 pinion gear toward the differential case. If the backlash is not within the specification, install the 2 side gear thrust washers of different thicknesses. HINT: Refer to the following table to select 2 thrust washers. (b) Using a pin punch (5 mm) and a hammer, install the straight pin through the differential case and hole of the pinion shaft. (c) Using a chisel and a hammer, stake the outside of the differential case pin hole. (e) Align the matchmarks on the ring gear and differential case. (f) Temporarily install 4 new lock plates and 8 bolts. (g) After the ring gear cools down enough, torque the 8 bolts uniformly. HINT: Tighten the bolts, in diagonal order, a little at a time until they are all tightened. (h) Using a chisel and a hammer, stake the 4 lock plates. Stake one claw so that it is flush against the flat surface of the bolt. As for the other claw, stake it against the surface of the bolt head so as to act as a stopper if the bolt starts to loosen. (a) Using SST and a press, install the case bearing (RH) to the differential case. (a) Using SST and a press, install the case bearing (LH) to the differential case. (a) Install the differential case to the carrier, and install the 2 plate washers so that there is no play in the bearing. (b) Install the 2 bearing caps with the 4 bolts. Torque: 79 N*m (800 kgf*cm, 58 ft*lbf) (c) Using a dial indicator, measure the runout of the ring gear. If the runout is greater than the maximum, replace the drive pinion, ring gear and differential case. (d) Remove the 2 bearing caps, 2 plate washers and differential carrier. (a) Using SST and a press, install the front bearing (outer race) to the carrier. (a) Using SST and a press, install the rear bearing (outer race) to the carrier. (a) Install the removed plate washer to the drive pinion. (b) Using SST and a press, install the rear bearing to the drive pinion. (a) Install the drive pinion and front bearing. (b) Install the rear differential drive pinion oil slinger to the drive pinion. (d) Coat the threads of the nut with hypoid gear oil LSD. (e) Using SST to hold the flange, torque the nut. Torque the nut a little at a time, being careful not to overtighten it. Apply hypoid gear oil LSD to the nut. (f) Using a torque wrench, measure the preload. If the preload is not within the specification, adjust the differential drive pinion preload or repair as necessary. (a) Place the 2 bearing outer races on their respective bearings. Make sure the right and left races are not interchanged. (a) Install the right and left bearing caps with the 4 bolts. When using a new side bearing select a thrust shim which is thinner than the removed one. If the side bearing is reused, select a thrust shim of the same thickness as the removed one. (b) Make snug the differential case bearing and thrust shim by tapping on the ring gear with a plastic hammer. (c) Set the dial indicator perpendicular to the end of the ring gear face. (d) While holding the rear drive pinion companion flange rear, rotate the ring gear and measure the backlash. NOTICE: Measure it at 3 points or more on the ring gear periphery. If the measured value is out of the specified value, select a proper thrust shim so that the backlash of the differential ring gear is within the value, and install it to the ring gear back side. (a) After adjusting the backlash of the differential ring gear, remove the teeth side thrust shim. (b) Using a micrometer, measure the thickness of the removed thrust shim. (c) Select a new thrust shim 0.06 to 0.09 mm (0.0024 to 0.0035 in.) which is thicker than the removed one. HINT: Select a thrust shim which can be pressed in 2/3 rds of the way by finger. (d) Using SST and a plastic hammer, drive in the thrust shim. (e) Align matchmarks on the bearing cap and differential carrier, and install the 2 bearing caps. NOTICE: Make sure the right and left bearing caps are not interchanged. (f) Tighten both bearing caps with the 4 bolts. (g) Set the dial indicator to the end of the differential ring gear face. (h) While holding the rear drive pinion companion flange rear, rotate the differential ring gear and measure the backlash. Backlash: 0.13 to 0.18 mm (0.0051 to 0.0071 in.) (i) If the measured value is out of the specified value, adjust it by increasing or decreasing the thickness of both right and left thrust shims equally. (j) Using a torque wrench, measure the preload. If the preload is not within the specification, adjust the total preload or repair as necessary. (a) Install the rear drive pinion front tapered roller bearing to the drive pinion. (a) Install the rear differential drive pinion oil slinger to the drive pinion. (a) Using SST and a hammer, install a new oil seal. SST 09554-22010 Oil seal drive in depth: 2.0 0.3 mm (0.079 0.012 in.) (b) Apply MP grease to the oil seal lip. (a) Using SST and a press, install a new dust deflector. NOTICE: Be careful not to damage the dust deflector. (a) Using SST, install the companion flange to the drive pinion. SST 09950- 30012 (09951- 03010, 09953- 03010, 09954-03010, 09955-03030, 09956-03020) (b) Coat the threads of a new nut with hypoid gear oil LSD. (c) Using SST to hold the flange, torque the nut. If the preload is less than the specification, retorque the nut with 13 N*m (130 kgf*cm, 9 ft*lbf) of torque at a time until the specified preload is reached. If the torque exceeds the maximum while retightening the nut, replace the bearing spacer and repeat the preload adjusting procedure. NOTICE: Do not loosen the pinion nut to reduce the preload. (a) Using a torque wrench, measure the preload. If the total preload is not within the specification, adjust the total preload or repair as necessary. (a) Using a chisel and hammer, stake the drive pinion nut. (a) Using SST and a hammer, install 2 new oil seals. (a) Install the breather plug to the carrier cover. (b) Clean contacting surfaces of any residual FIPG material using gasoline or alcohol. (c) Apply FIPG to the carrier. FIPG should be applied 2 to 3 mm (0.08 to 0.12 in.) in diameter with no break. Allow for an overlap of 10 mm (0.39 in.) or more between the start and end of FIPG application. Install the carrier cover within 3 minutes after applying FIPG. Do not add oil immediately after installing the cover, and leave differential carrier as is for at least an hour. Also, for 12 hours or more, avoid rapid acceleration/deceleration. (d) Install the carrier cover with the 8 bolts. (a) Using SST, install a new rear differential mount cushion No.1. 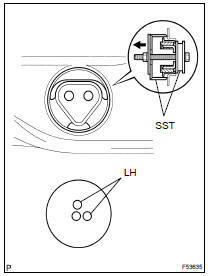 NOTICE: Do not set the SST in the wrong direction. HINT: Perform this operation only when the rear differential mount cushion No.1 replaced. (a) Using SST, install a new rear differential mount cushion No.2. HINT: Perform this operation only when the rear differential mount cushion No.2 replaced. (a) Install the rear differential support No.1 to the differential carrier assy rear with the 2 bolts and 2 lock nuts. (a) Jack up the differential carrier assy rear and rear suspension member with a jack. (b) Connect the rear differential support No.1 to the rear suspension member with 2 bolts and 2 lock nuts. (c) Install the differential carrier assy rear to the rear suspension member sub-assy with the 3 bolts. HINT: Installation procedure of the RH side is the same as that of the LH side. (a) Using a hexagon wrench (10 mm), install the drain plug with a new gasket. (a) Using a hexagon wrench (10 mm), install the filler plug with a new gasket.